I didn't get to really participate in a fresh meat program. Sure, I was considered "fresh meat for the standard three months" but my training was very trial-by-fire. But I ain't complaining, and it just demonstrates the fact how much our league has grown in the past two years since I joined. Haven't strapped on skates in a couple years? Maybe more like a decade or two? No problem. The ability to skate comes right back to you. 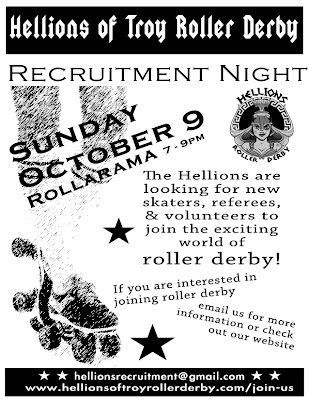 Come check out the Hellions this Sunday night at Rollarama Skating Center (2710 Hamburg Street, Schenectady) at 7pm. Email hellionsrecruitment@gmail.com if you have questions in advance.